Is a Lighter Bike Faster? Posted byJohn	 October 27, 2014 Leave a comment on Is a Lighter Bike Faster? Editor’s Note: This excerpt is adapted from the book FASTER: Demystifying the Science of Triathlon Speed by Jim Gourley and republished with permission from VeloPress. Learn more about the science of triathlon at freetrispeed.com. Let’s clear something up. There is no such thing as a “fast bike.” Bikes are neither fast nor slow. Bikes are shiny or expensive. Bikes have a lot of mass or a little. Without a rider, they are stationary. Physics holds a bike in place until you get on it and start pedaling. Even then the bike may not necessarily be fast. Of all the equipment on your bike, your legs are the most critical component. There are plenty of nice bikes on the road that are being ridden slowly. In FASTER, I show the math that explains why just a degree or two of incline makes riding a bike feel so much harder. Riding up a hill, it may seem more important than ever to dump any and all extra mass we can from our bikes. That’s the allure of a carbon fiber bottle cage, an upgrade to carbon fiber cranks, handlebars, stem, carbon saddle rails, or wheel spokes. Five grams here, 10 grams there, it all adds up, right? Pretty soon, you’re 500 grams lighter. That’s half a kilogram! A good approximate difference between an entry-level aluminum bike with a decent set of components and a top-of-the-line carbon model with some of the lightest components on the market is just shy of 3.25 pounds. Let’s find out. Take a hypothetical rider and have her ride two bikes up a hill at the same speed. The first bike weighs 15 pounds and the second bike will shave off the 3.21 pounds to weigh in at 11.79 pounds. For each test, we’ll have her ride at 15 mph. Everything is constant, except for the bike, so what we ought to see is a reduction in the power required to get up the hill. That’s the real test of your savings. Refer to the second image, above, for a graph of the results. If you’re having trouble telling what the difference is, save yourself the eyestrain, because there isn’t much — that’s the message. The implication is a bitter pill, though. If you want to reduce the power requirement by 1 percent, you have to reduce the total mass that’s moving up the hill by 1 percent. 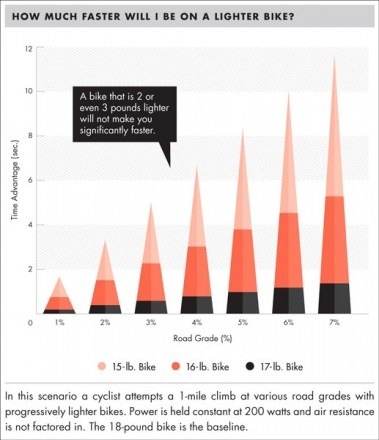 And because you’re moving both your body and the bike up the hill, a measly 1 percent equates to a whole lot of grams before you see returns on your carbon investment. If the power argument doesn’t quite satisfy you, we can look at it another way. Let’s answer the question you really care about: How much faster does it make me? After all, you win races by saving time, not watts. Let’s see what will happen when our hypothetical rider rides bikes of varying weight up different hills. We’ll hold power at a constant 200 watts and have her ride up a 1-mile climb at seven different grades (1–7 percent). 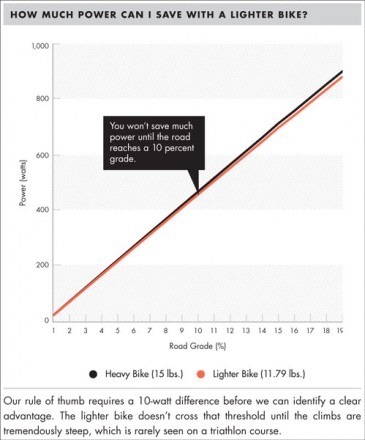 Let’s look at the difference between 15-, 16-, 17-, and 18-pound bikes, with the 18-pound bike serving as the baseline. Because of the complexity involved, we’ll eliminate air resistance and analyze the impact of weight reduction only. How much time do we save? A graph of the results is in the third image above. Look at the far right of the graph. Take 3 pounds off your bike, pedal at a constant rate of 200 watts, and you’ll get to the top of a 7 percent climb a whole 7.5 seconds ahead of the competition. A 1-pound advantage only puts you ahead by 2.5 seconds. Over the course of an hours-long race, a few seconds per climb is not a significant advantage. Keep in mind that the advantage only holds when the climbs are long and steep. Courses with fewer and shorter ascents will keep the difference small.